I recently completed the book The First 90 Days by Michael Watkins. It was a gift from my wife, Chris, for Valentine’s Day. I don’t know if it was a message or not – “New Leaders at All Levels” was who the book was designed to target. I had been in real estate for three years now!!! In any event, I dove in head first and found this to be an insightful book for new leaders. 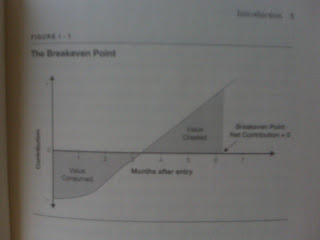 The book starts out by defining the “Breakeven Point” for new leaders, which is defined as the ‘Point’ at which new leaders have contributed as much value to their new organizations as they have consumed from it. The average time that CEOs said was the time at which a new manager hit this point was 6.2 months (pg. 2&3). The book attempts to outline a process whereas that time (6.2 months)can be accelerated and the success of new leades in their positions increased. When I heard there was a process, it made it an easy read for me as I tend to enjoy books that define processes to achieve a goal. This book was no different. This book was not a one-size-fits-all either. The author identifies 4 different scenarios defined as STaRS (the a is actually supposed to be superscript!). S-Start-up, T-Turn around, R-Realignment, and S-Success and different challenges and opportunities with each scenario. I found the book to be a little short on real life examples and the visuals to be a little complex; however, I feel this will be a good reference book for me in the future. During previous book reviews, I used my rating system based upon ‘dogears‘. How many pages did I ‘dogear‘ for future reference? There were more than 10, so I would give this book a Top ’10 dog-ear’ rating. I recommend it to new leaders at managerial levels, AND I think this would be a good book for those who ‘aspire’ to move up in their organization or careers as well. During an interview, I believe MANY times you will be asked “What will you do in the first 30,60, or 90 days in your new role?” How great would it be if you could use the tips in this book as a way to answer that question?! It would impress me. I would like to share this book with you. Be the first to a) comment on this post, b) subscribe to this blog via Reader or email, and c) commit to reviewing the book as a guest blogger when you complete it! I will mail you a copy of the book. This entry was posted on Saturday, May 9th, 2009 at 3:14 pm	and is filed under Book review, Continuous Improvement, Leadership. You can follow any responses to this entry through the RSS 2.0 feed. You can leave a response, or trackback from your own site.